Wally Bryson, guitarist with the Raspberries played one of two Rickenbackers he owned on two of the group’s greatest hits namely: “I Wanna Be with You” and “Let’s Pretend.” These songs were written by Eric Carmen for the Rickenbacker 12 string as this is said to be a sound that he always loved. This love continues to the present day as Eric apparently bought a Rickenbacker 12-string at the Guitar Center in the mid 80’s. 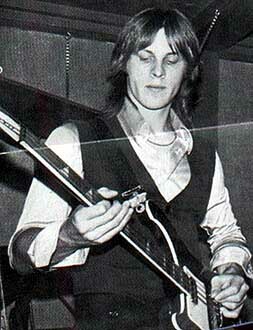 A photograph acquired recently shows Eric playing a Rickenbacker 12 string at one of the Raspberries last performances. Scott McCarl played a Rickenbacker bass similar to Paul McCartney’s 4001. Photographs of Eric Carmen and Scott McCarl playing Rickenbackers follow this text. 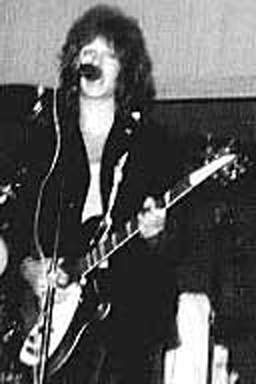 Persistent attempts to obtain Raspberries’ fine guitarist Wally Bryson playing a Rickenbacker have been unsuccessful to date. Eric Carmen is said to have met John Lennon for the first time at the Record Plant where the Raspberries were recording their “Starting Over” album. It was quite the introduction with Eric hitting John in the face with the men’s room door. Eric and Raspberries’ drummer Mike McBride were invited by Lennon to hand-clap in the background for the Harry Nillson track “Loop de Loop” on the “Pussycats” album. John Lennon is said to have loved the Raspberries album and rumour has it that John assisted the group with the mix of their song “Overnight Sensation.” The Raspberries had a poster in their recording studio that Lennon painted over including eyeglasses and other swirls of color, signing it at the bottom. Surprisingly, none of the group members took the poster home from the studio and its current whereabouts remains unknown. It had been rumoured for some time that Lennon was so taken with the Raspberries’ music and Eric Carmen’s interest in the Rickenbacker 12 string that he present a member of the Raspberries with a Rickenbacker 360/12 Fireglo. It was not possible to document this through any written source either than the interesting comments made in preparation for a Bonham’s Auction. Repeated visitations to the site were unable to determine whether the instrument was purchased, and if so, for what amount. The photograph and particulars of the instrument and the auction are presented here. To Peter McCormack: I heard about this auction some time ago and to the best of my knowledge John Lennon didn’t give any Rickenbacker 12-string guitar to any of the Raspberries. I’m not sure how this story came about, but I’m pretty sure if John HAD given any of us the guitar we would remember. Thus ends the story and speculation regarding yet another Rickenbacker guitar owned by John Lennon. © Rickresource. All rights reserved.